In a new discovery, scientists using the Spitzer Infrared Space Telescope detected tiny specks of matter, or particles,consisting of stacked buckyballs. 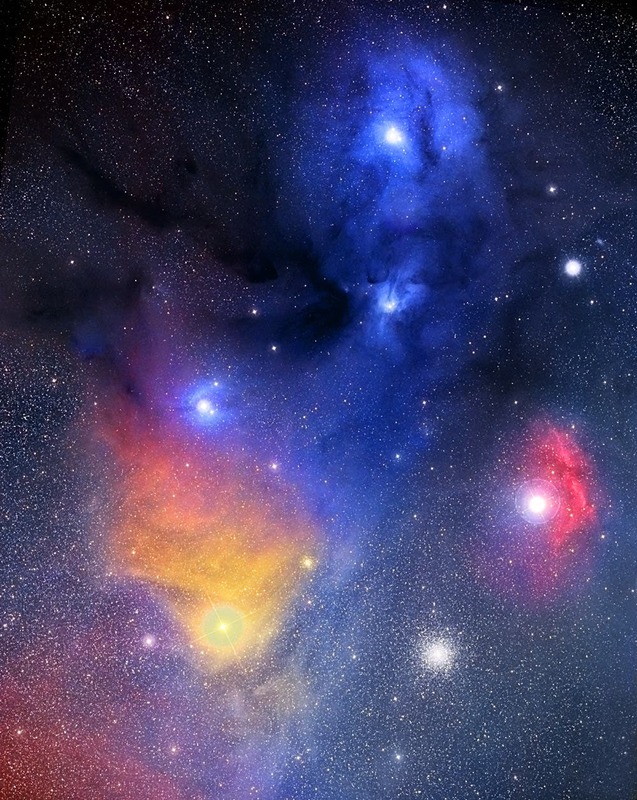 They found the particles around a pair of stars called "XXOphiuchi," 6,500 light-years from Earth, and detected enough to fill the equivalent in volume to 10,000 Mount Everests. These exotic particles (image below) were detected definitively in space for the first time by Spitzer in 2010. Spitzer later identified the molecules in a host of different cosmic environments. It even found them in staggering quantities, the equivalent in mass to 15 Earth moons, in a nearby galaxy called the Small Magellanic Cloud. "This exciting result suggests that buckyballs are even more widespread in space than the earlierSpitzer results showed," said Mike Werner, project scientist for Spitzer at NASA's Jet PropulsionLaboratory in Pasadena, Calif. "They may be an important form of carbon, an essential buildingblock for life, throughout the cosmos." Formally named buckministerfullerene, buckyballs are named after their resemblance to the latearchitect Buckminster Fuller's geodesic domes. They are made up of 60 carbon moleculesarranged into a hollow sphere, like a soccer ball. 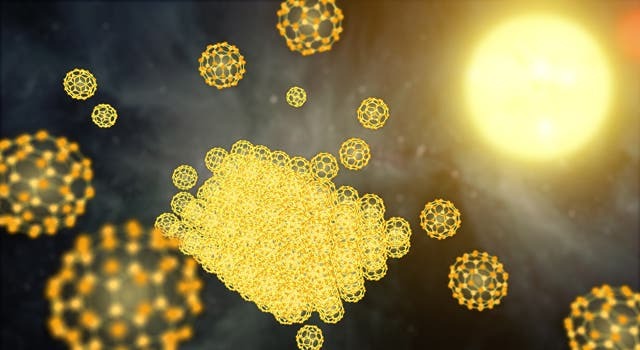 "These buckyballs are stacked together to form a solid, like oranges in a crate," said Nye Evansof Keele University in England, lead author of a paper appearing in the Monthly Notices of theRoyal Astronomical Society. "The particles we detected are miniscule, far smaller than the widthof a hair, but each one would contain stacks of millions of buckyballs." In all of those cases, the molecules were in the form of gas. The recent discovery of buckyballsparticles means that large quantities of these molecules must be present in some stellarenvironments in order to link up and form solid particles. The research team was able to identifythe solid form of buckyballs in the Spitzer data because they emit light in a unique way thatdiffers from the gaseous form. Buckyballs have been found on Earth in various forms. They form as a gas from burning candlesand exist as solids in certain types of rock, such as the mineral shungite found in Russia, andfulgurite, a glassy rock from Colorado that forms when lightning strikes the ground. In a testtube, the solids take on the form of dark, brown "goo." "The window Spitzer provides into the infrared universe has revealed beautiful structure on acosmic scale," said Bill Danchi, Spitzer program scientist at NASA Headquarters in Washington. "In yet another surprise discovery from the mission, we're lucky enough to see elegant structureat one of the smallest scales, teaching us about the internal architecture of existence." JPL manages the Spitzer Space Telescope mission for NASA's Science Mission Directorate inWashington. Science operations are conducted at the Spitzer Science Center at the CaliforniaInstitute of Technology in Pasadena. Caltech manages JPL for NASA.